23 October 2014 – Mayor of Ellesmere Port, Councillor Brian Jones, has officially launched a booklet detailing the history of Whitby Road, written from local people’s experiences and memories. Compiled by the Ellesmere Port Local & Family History Society, ‘Whitby Road Memories’ remembers shops including Burtons, Co-op, Cleggs, The Louvre, and Dyson’s to name just a few through and shares the tales through the eyes of the local community. The booklet will be available before Christmas at locations around the town including Trinity Church, Montague Cafe, the Paperboat Gallery, and through the Society and has been completed at the same time as workmen uncovered a historic shop front sign above 2c Whitby Road. 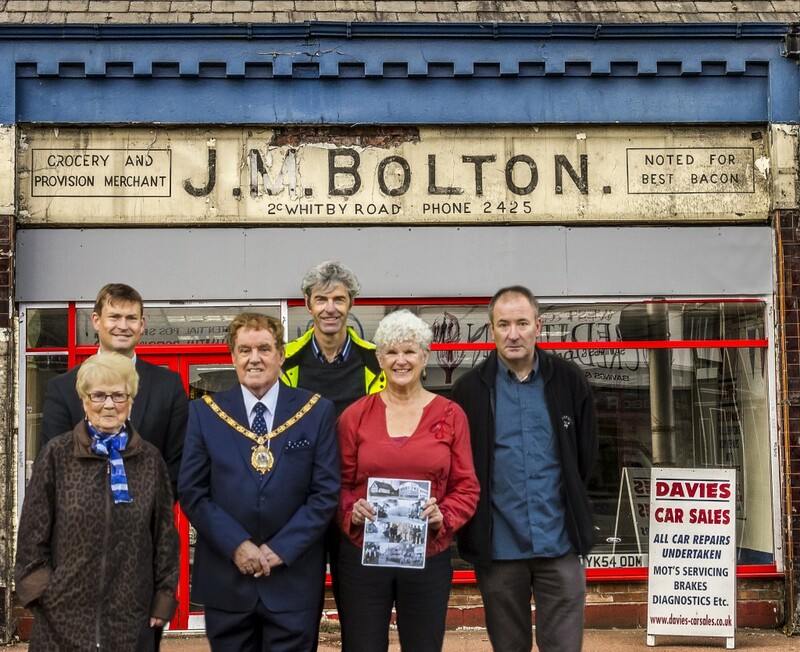 During recent shop front improvements at Davies Car Sales, the original shop sign of grocer J. M. Bolton has been uncovered, and been temporarily left in situ for viewing. The old signage of Bolton grocer with slogan ’noted for best bacon’ was amongst more uncovered signage including R.T. Valentine Ltd – butcher, and Stanways Garage. Mayor of Ellesmere Port, Councillor Jones, said: “Whitby Road has been the heart of the town for over a century and I am really looking forward to the ‘Whitby Road Memories’ publication by the local history society that will no doubt bring back many pleasant memories about the town’s past. Chair of the Ellesmere Port Local & Family History Society, Celia Webber, said: “It’s been an absolute joy to collect the stories and photos of Whitby Road from the Society’s members and their friends. With regeneration of Whitby Road progressing rapidly, the history society is placing the spotlight on how much the road has changed in hardly one hundred years. Local members of the society have come together to share memories, provide historic information, and write chapters about the different shops that have been in Whitby Road. Davies Car Sales is undergoing extensive shop front modernisation works as part of the Council’s ambitious regeneration project for Whitby Road. Local member, Councillor Justin Madders, said: “It was a nice surprise to see the old sign uncovered during the works and served as a good reminder about how much the road has changed over the years. For more information on ‘Whitby Road Memories’ or to obtain a copy please contact the Ellesmere Port Local & Family History Society’s Celia Webb by emailing celiawebb@aol.com. For further detail about the regeneration of Whitby Road please email Town Centre Manager Jochem Hollestelle at Jochem.hollestelle@cheshirewestandchester.gov.uk.